Smart Utility Systems (SUS) – the leading provider of cloud-based Software-as-a-Service (SaaS) platforms for the energy and utility sector in the areas of customer engagement, mobile workforce and data analytics—today announced that it has received a 2016 SAP® Pinnacle Award as the OEM Partner of the Year, which recognizes its outstanding contributions as an SAP partner. SAP presents these awards annually to the top partners that have excelled in developing and growing their partnership with SAP and helping customers run better. Winners and finalists in 19 categories were chosen based on recommendations from the SAP field, customer feedback and performance indicators in the following umbrella categories: Build, Service, and Sell with each category including a Customers’ Choice award, which recognizes a customer-nominated SAP partner. Utility companies are seeking analytical solutions that can help them identify their customers’ actions and tailor their operations from call center to customer outreach to meet those behaviors. SUS believes a well-thought-out customer engagement strategy helps utilities maximize operational efficiency and meet customers’ needs. Deployed together, SUS’s Smart Customer Mobile (SCM®) platform and the SAP HANA Cloud Platform (HCP) with Hybris advanced technology help utility companies transform business processes and maximize return on smart grid and smart city investments. 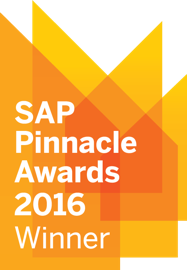 SAP Pinnacle Awards shine a spotlight on SAP’s partners’ remarkable contributions, acknowledging their dedication to teamwork, innovative approach and capacity to challenge what is possible to help customers achieve their goals. Award winners will be formally recognized at the SAP Global Partner Summit being held on May 16, in conjunction with SAPPHIRE® NOW, SAP’s international customer conference being held in Orlando, Fla., May 17–19. For more information about SUS, visit http://www.smartusys.com. Members of the media interested in scheduling an interview with an SUS representative should contact Leslie Licano at 949-733-8679 ext. 101 or leslie(at)beyondfifteen.com. About Smart Utility Systems: Smart Utility Systems (SUS) is the leading provider of cloud-based Software-as-a-Service (SaaS) platforms for customer engagement, workforce mobility and big data intelligence and analytics to the energy, water and gas utility sectors. SUS pledges to foster global sustainability by identifying and influencing consumer behavior through innovative customer engagement strategies. It offers rapid deployment solutions that integrate seamlessly with existing systems and reduce costs and complexity, enabling clients to reduce operational and IT costs. SUS is headquartered in Irvine, California. For more information, please visit http://www.smartusys.com or call (909) 217-3344. Connect with SUS on LinkedIn or Twitter. SAP Forward-looking Statement: Any statements contained in this document that are not historical facts are forward-looking statements as defined in the U.S. Private Securities Litigation Reform Act of 1995. Words such as “anticipate,” “believe,” “estimate,” “expect,” “forecast,” “intend,” “may,” “plan,” “project,” “predict,” “should” and “will” and similar expressions as they relate to SAP are intended to identify such forward-looking statements. SAP undertakes no obligation to publicly update or revise any forward-looking statements. All forward-looking statements are subject to various risks and uncertainties that could cause actual results to differ materially from expectations. The factors that could affect SAP's future financial results are discussed more fully in SAP's filings with the U.S. Securities and Exchange Commission ("SEC"), including SAP's most recent Annual Report on Form 20-F filed with the SEC. Readers are cautioned not to place undue reliance on these forward-looking statements, which speak only as of their dates.